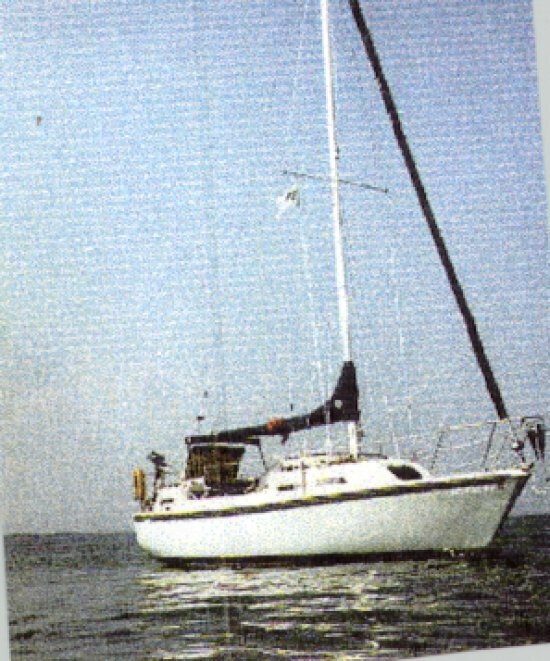 The Parker Dawson 26 is a center cockpit, swing keel, trailerable pocket cruiser. This boat was also manufactured over different time periods under the names Dawson 26, Bombay 26, and Nauset 26. The boat is intended to be a trailerable boat for cruising in all waters. The boat has a front and rear cabin, with an amazing amount of room for a trailerable boat. Most boats are equipped with wheel streering, inboard Yanmar diesel, two heads (one in each cabin), fuel, fresh, and blackwater tanks. The Parker Dawson is no longer manufactured with the last model built approximately around 1984-'85. The new selling price for this boat in a bare boat condition was $26,000; however, when upgraded with wheel steering, inboard, trailer, etc., the price was quickly driven up to $40,000. This is a very well-built boat and has recorded crossings of both the Atlantic and Pacific. The layout of this boat, while being very comfortable and practical, does not make it one of the more attractive hulls on the water. Also, the weight and characteristics do not make it one of the faster 26 footers on the water. For comfort, convenience, and safety, however, this is probably one of the best 26 foot boats on the water.